Rick Stevens is a professor at the University of Chicago and the Associate Laboratory Director for the Computing, Environment, and Life Sciences directorate at Argonne National Laboratory. 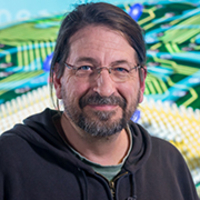 He is internationally known for work in high-performance computing, collaboration and visualization technology, and building computational tools for genomics-based analyses of infectious diseases. Stevens is a principle investigator for the Pathosystems Resource Integration Center (PATRIC), a Bioinformatics Resource Center that incorporates several of these tools. Stevens plays a central role in the Exascale Computing Project, a DOE collaboration responsible for the planning and preparation of a capable exascale ecosystem, including software, applications, hardware, advanced system engineering and early testbed platforms. He is the lead principal investigator of the Exascale Deep Learning and Simulation Enabled Precision Medicine for Cancer project, which is building a scalable deep neural network code called the CANcer Distributed Learning Environment (CANDLE). Stevens also leads one of three AI-based cancer research projects that use CANDLE. The projects simultaneously target priority NIH cancer treatment challenges, and define exascale computing requirements. In addition, Stevens is a co-principal investigator on a multi-institutional effort to study the effects of traumatic brain injury. Over the past twenty years, Stevens and his colleagues have developed the SEED, RAST, MG-RAST and ModelSEED genome analysis and bacterial modeling servers that have been used by tens of thousands of users to annotate and analyze more than 250,000 microbial genomes and metagenomic samples. Stevens teaches and supervises students in the areas of computer systems and computational biology.